John Bourchier, 2nd Baron Berners (1467 – 19 March 1533) was an English soldier, statesman and translator. 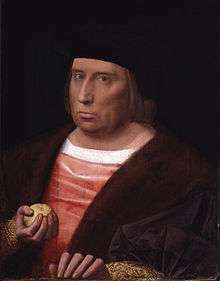 John Bourchier, born about 1467, was the only son of Sir Humphrey Bourchier (d.1471) and Elizabeth Tilney (d.1497), the daughter and sole heir of Sir Frederick Tilney of Boston, Lincolnshire. Through his father, Bourchier was descended from King Edward III; his great-grandmother, Anne of Gloucester, was the daughter of Thomas of Woodstock, King Edward's youngest son. By his mother's first marriage, Bourchier had two sisters, Anne, who married Thomas Fiennes, 8th Baron Dacre of Gilsland, and Margaret, who married firstly, John Sandys, secondly, Sir Thomas Bryan, and thirdly, David Zouche. After the death of Sir Humphrey Bourchier, his widow, Elizabeth, married Thomas Howard, then Earl of Surrey, and later 2nd Duke of Norfolk. 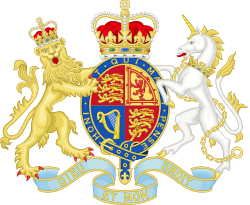 By his mother's second marriage Bourchier had ten siblings of the half blood, Thomas Howard, 3rd Duke of Norfolk, Lord Edward Howard, Lord Edmund Howard, Sir John Howard, Henry Howard, Charles Howard, Henry Howard (again), Richard Howard, Elizabeth Howard, and Muriel Howard. After his father was slain fighting on the Yorkist side at the Battle of Barnet in 1471, Bourchier became a ward of John Howard, 1st Duke of Norfolk. As noted above, Bourchier's mother, Elizabeth, had married as her second husband Thomas Howard, the eldest son and heir of Bourchier's guardian by his first wife, Katherine Moleyns. In 1474 Bourchier's grandfather, John Bourchier, 1st Baron Berners, died, and Bourchier inherited the title at the age of seven. He was educated at Oxford University. Bourchier held various offices of state, including Lieutenant of Calais from 28 November 1520 and Chancellor of the Exchequer from 14 July 1524 that of to King Henry VIII. He translated, at the King's desire, Froissart's Chronicles (1523–1525), in such a manner as to make a distinct advance in English historical writing, and the Golden Book of Marcus Aurelius (1534), as well as The History of Arthur of Lytell Brytaine (Brittany), and the romance of Huon of Bordeaux. Bourchier died at Calais in 1533. Thomas Bourchier, who predeceased his father. Joan Bourchier (d.1561), who married Sir Edmund Knyvet (d. 1 May 1539), sergeant porter to King Henry VIII, and was her father's heir. Margaret Bourchier, who predeceased her father. Mary Bourchier, who married Alexander Unton of Wadley, but died without issue, predeceasing her father. Humphrey Bourchier (d.1540), esquire, who married Elizabeth Bacon, but had no issue. After Humphrey Bourchier's death his widow married George Ferrers, esquire. Sir James Bourchier (d.1554), who married Mary Bannaster, daughter of Sir Humphrey Bannaster. Ursula Bourchier, who married Sir William Sharington. ↑ Richardson I 2011, pp. 280–288; Carley 2004. ↑ Carley 2004; Richardson I 2011, pp. 284–5. ↑ Richardson II 2011, pp. 412–413. ↑ Richardson I 2011, p. 287; Richardson II 2011, pp. 412–413; Challis 2004. ↑ She is said to have been named Elizabeth Bacon, but according to Richardson this is likely the result of confusion between Bourchier's mistress and the wife of his illegitimate son, Humphrey Bourchier. ↑ Richardson I 2011, pp. 287–90; Challis 2004. ↑ Richardson I 2011, p. 287; Challis 2004. Chisholm, Hugh, ed. (1911). "Berners, John Bourchier". Encyclopædia Britannica. 3 (11th ed.). Cambridge University Press.